Mercedes GP's W02 has been struggling with overheating issues ever since it hit the track during winter testing, and it seems the team have yet to find a definitive solution. After adding shark gills at various locations on the rear end of the sidepods, at China a new cooling opening suggests that wasn't sufficient. Replacing the 3 small gills is now a single large opening, exactly above the engine exhaust. 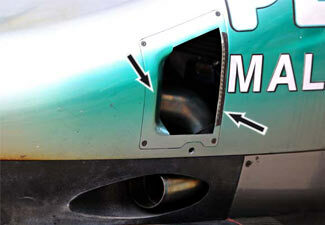 The hole exposes the exhaust pipe to the viewer as it helps to evacuate hot air from within the sidepod to the outside. An interesting detail is the addition of a gurney flap ahead of the opening, something that adds drag but will greatly help hot air extraction. I ask this sincerely: how is this legal?